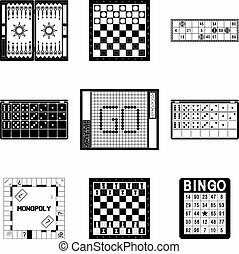 Board games vector icon. Vector isolated flat icons collection on a white background for design. Chess board icon. Vector illustration. Vector icon. Chess board. Content strategy. Adding subscribers. 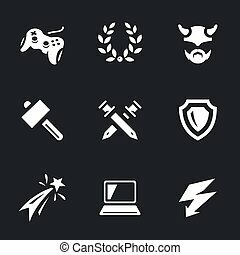 joystick, laurel wreath, warrior, hammer, crossed swords, shield, fireworks, notebook, lightning. Robot, chip, ball, joystick, glory, cup, fans, gate, laptop. Glasses, 3d, gamepad, wi-fi, game network, radar, soldier, ball, punch hand. 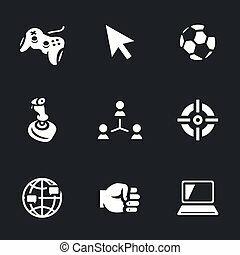 Gamepad, choice, soccer ball, joystick, social network, sight, peace, fist, laptop. Ship, sight, explosion, joystick, battle, gamepad, flag, peace, periscope.